During a brief break in the snowstorm, BFC’s Mark and Don climb atop a massive pile of snow, clearing space for more snow to fall. Photo by Stephany Seay, Buffalo Field Campaign. It’s nearly March, and Winter has finally arrived in earnest. We have been getting hammered by heavy snowfall since Saturday. 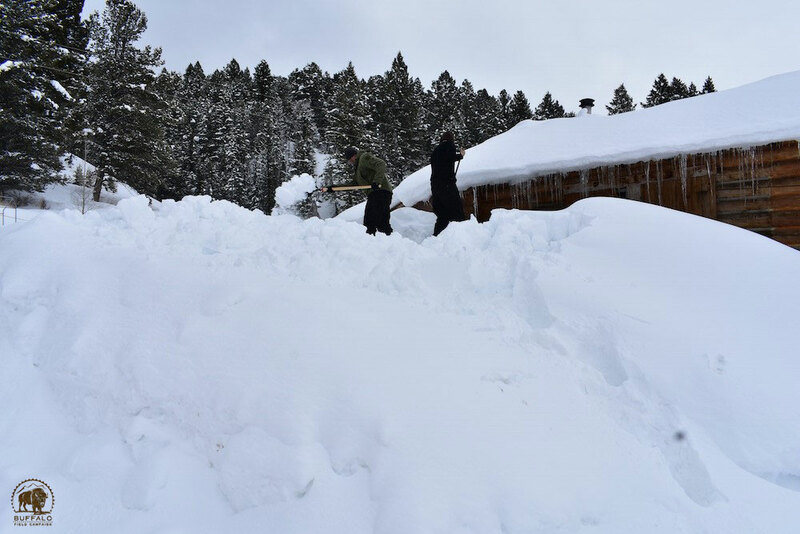 Some highways have been closed, and the town of West Yellowstone is carting snow away because they have no where to put it. It’s not that we’re not used to this much snow, but not so much so quickly. Driving to get to our patrol areas has been treacherous due to white-out conditions (image) and snow drifts, and visibility has been extremely poor, but we’re still out there. And when folks aren’t in the field, they are staying busy shoveling and plowing. But, we at BFC love the snow and welcome it. Even with so much snow, at least here in the Hebgen Basin, the buffalo have still not migrated into Montana. 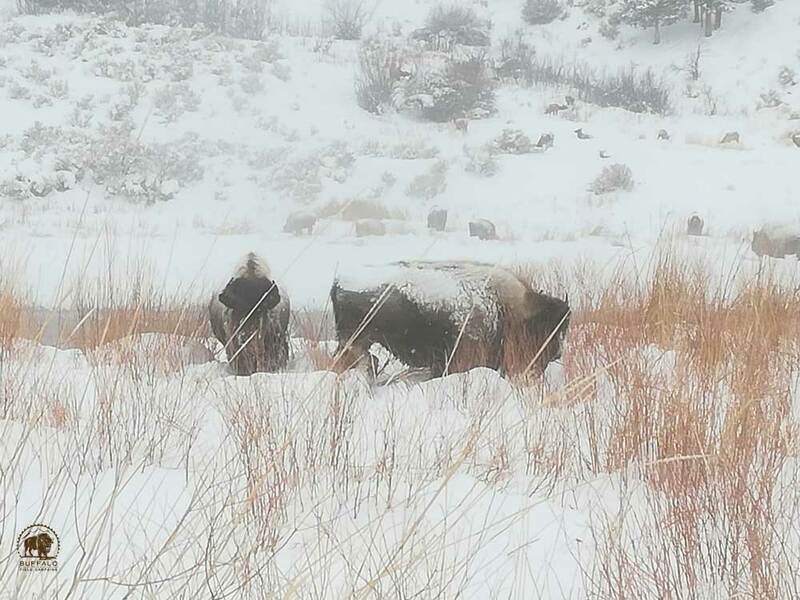 Snow-covered buffalo enjoying Ice Age elements inside Yellowstone National Park. Photo by Georg Bergthaler, Buffalo Field Campaign. In the Gardiner Basin, patrols have been on edge with buffalo starting to move towards the Gardiner Basin. Luckily, so far, they have inched their way close to “management” areas but have then disappeared deeper into the safety of the Park. Just the other day, when BFC co-founder Mike Mease was leading a patrol in Gardiner, he saw about 80 buffalo in an area we call Powerline Flats. Powerline Flats is the southern edge of the massive public closure, where buffalo can be harassed by Yellowstone park wranglers, and it’s just a few miles away from both Yellowstone’s Stephens Creek trap and the hunter-lead kill zone of Beattie Gulch just outside the park’s north boundary. Nervous that this was about to be the beginning of what was surely going to be a buffalo blood bath, huge sighs of relief were exhaled as this herd, in Mike’s words, “made a bee-line straight up the mountain and into the clouds.” While buffalo are a bit closer to the Gardiner Basin than they have been all winter, they are continuing to stay clear of the danger zones for now. With the big snow events we’ve had over the past month, it is unusual that migration instincts would not be triggered. But, we know that buffalo are highly intelligent beings and they are learning when it is safe — and when it’s not — to move into Montana. BFC volunteer coordinator, Jaedin Medicine Elk, Northern Cheyenne, speaks out against HB 132 at the Montana Senate Livestock, Agriculture, and Irrigation committee hearing. Photo by Stephany Seay, Buffalo Field Campaign. With the field being relatively quiet right now, we were able to send a crew of folks to Helena last Thursday, to represent wild buffalo in opposing HB 132, a bill that aims to re-define “wild.” Not surprisingly, this bill is endorsed by the cattle lobby, though we were pleased to see that there were more opponents than proponents represented at the hearing. HB 132 has already passed Montana’s House, and was heard in the Senate Livestock, Agriculture, and Irrigation Committee. We expected the Senators to push this bad bill through, but they surprised us. There was a lot of debate about language in the bill that aimed to state that a wild buffalo has “never been reduced to captivity” and has “never been owned by a person.” The word “never” was a big concern for wild buffalo advocates, as many feared that this may have an impact on Yellowstone's Northern Herd, as some of them had been brought in by humans many decades ago (the Central Herd buffalo are the descendants of the 23 who have continuously lived on this land since prehistoric times). Some of the same opponents expressed concern that this would also impact quarantine buffalo, who, they feared, would never be considered wild. While BFC strongly opposes this bill, we also strongly oppose quarantine and maintain that buffalo who suffer this process are domesticated. They will never roam free, and are essentially reduced to becoming meat for humans. Nevertheless, it was agreed that by changing “never” to “not” would soften, if not eliminate, the threat to the Northern Herd and to buffalo who are forced through quarantine. 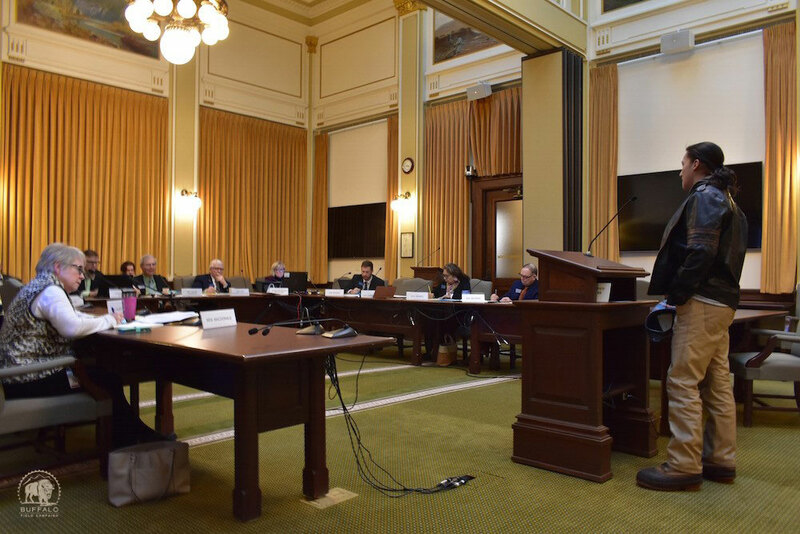 The Senate Ag Committee stated they would not make any decisions on the bill during the hearing, but would take it up again after some negotiations between the bill’s sponsor and Montana Fish, Wildlife & Parks, and amendments had been made. So far, no further action has been taken. BFC stands strong in opposing this bill in its entirety, holding fast that there are no amendments that can fix it. This bill must be voted against or vetoed by Governor Bullock. 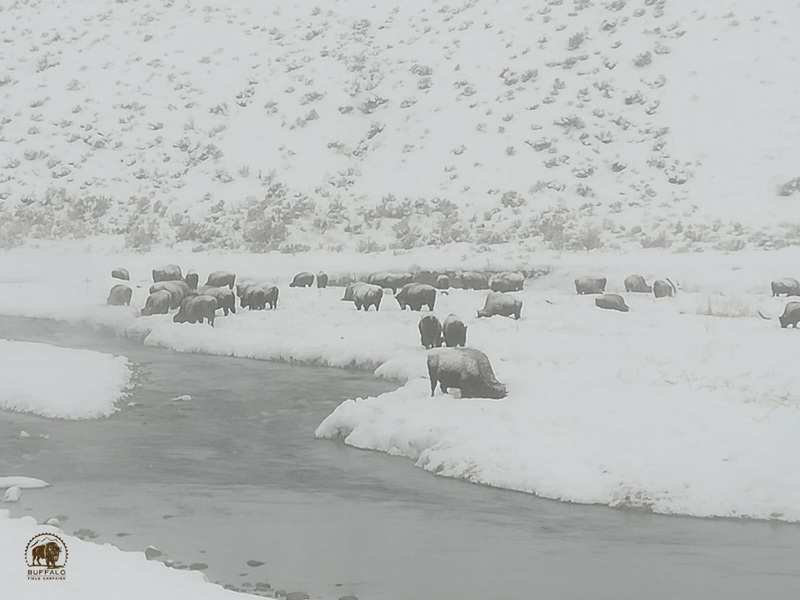 Buffalo graze in a blizzard along the Gardiner River inside Yellowstone National Park. Photo by Georg Bergthaler, Buffalo Field Campaign. Speaking of the reality of domestication through quarantine, five bull buffalo who have been held captive by USDA’s Animal & Plant Health Inspection Service (APHIS) were transported 400 miles to the Ft. Peck Reservation last Friday. These bulls have been in captivity at Corwin Springs since 2011. They were originally captured and handed over to APHIS for their experiments with the chemical sterilant GonaCon, an unapproved program BFC was instrumental in shutting down. Apparently, the buffalo in this particular facility (there were three GonaCon facilities in total) were never given the GonaCon chemical, so APHIS suddenly decided that they would be appropriate for quarantine. Now that the buffalo have arrived at Ft. Peck they will remain in captivity under quarantine conditions for another full year. Even after they are released from quarantine, they will only roam until they bump into the next fence line. 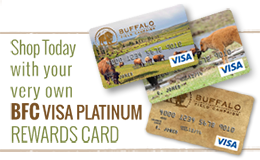 BFC fully supports wild, migratory buffalo being restored on Tribal lands everywhere they once roamed, but we support them doing it on their own four feet. The livestock paradigms force-fed to Tribes are a threat to the wild integrity of migratory buffalo, as well as a threat to their intended relationship with the land and the other wild beings who evolved with them. Quarantine is just another tool of the dominant culture that aims to maintain control over those who should be free. The notion that quarantine somehow stems the tide of slaughter is also false; scores of buffalo have been shipped to slaughter after repeated handling and testing by humans, and many have died from fires and dehydration because they couldn’t escape their enclosures. Every buffalo who is chosen for quarantine is captured, separated from family, run through the squeeze chute, and those who survive are “managed” like livestock. Quarantine removes buffalo from their wild habitat, from their homes, and reduces the number of buffalo that Tribes may interact with, and that grizzly bears and wolves need to survive. The only thing quarantine serves is humans. BFC will never compromise our position on quarantine, because we know if the buffalo were asked what they would choose (and no one else seems to be asking them), they would choose dignity, respect, and most of all freedom.